At Master Muffler Brigham City, we work hard to provide our city and the surrounding areas with the best automotive care available. Our quality service brings customers from all around the greater Cache Valley including cities like: Logan, Tremonton, and Nibley! Here in Brigham City, we all rely on our cars to get us where we need to be, and help us with the work that needs to be done. However, a car with dysfunctional brakes is not only useless… it’s a hazard to you and everyone else on the road. Frequently driving in mountains, as many Brigham City residents do, can put extreme stress on your brakes. Our Master Muffler auto repair shop in Brigham City is staffed with experienced technicians who can identify and repair any problems that might come up with your brakes, or simply conduct general maintenance. To put it simply, brakes work by converting your car’s kinetic energy (its movement and velocity) into heat energy using friction. The most common brakes used today are disc brakes, wherein a brake disc is attached to each wheel, and pressured to stop when it comes in contact with the brake pad. 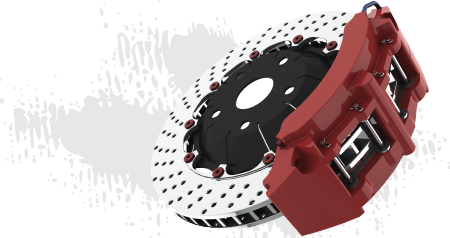 The pad and disc are brought into contact through the brake caliper’s compression, which in turn is triggered by the car’s hydraulic braking system. A hydraulic system is a wonderful way to ensure even distribution of force, as well as efficient magnification of the force that you use to press the brake pedal. A malfunction in any part of the braking system can cause dangerous problems. 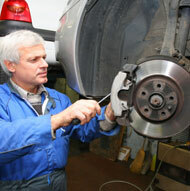 However, the most common problems that we see have to do with the brake pads, shoes, rotors, and fluid. Brake Pad Replacement: Since brakes utilize friction in order to slow and stop your car, it’s inevitable that they’ll feel some wear after a while. Usually, that wear is most obvious on the brake pad. When the brake pad wears down, you might hear a squeaking or squealing sound as you brake, or perhaps even some grinding. Brake pads are important to replace in a timely fashion, because a worn-down pad can cause damage to other parts of the system, which are trickier and more expensive to fix or replace. Hydraulic fluid leak: If the brake fluid is leaking, it can greatly impact the functionality of your car. A leak can cause you to lose pressure, which will mean that it will either require much more force to make your car stop, or prevent you from being able to stop altogether. If you’re seeing evidence of leaking brake fluid, have us check it out immediately. The leak could be originating from anywhere; from your reservoir to the hydraulic lines to the master cylinder. Warped rotors: If rotors are exposed to extreme heat and pressure (which often happens if you drive up and down hill a lot, as we do in the mountains) they can warp. Rotors need to be flat in order to maintain sufficient contact with the brake pads. A warped rotor will make your car stop slower, and could also cause your wheel and car to shake as you slow down. Stuck calipers: Stuck calipers can cause your brakes to be applied even when you’re not actively holding the pedal. It causes early wear on your brake system, creates problems with acceleration and deceleration, and often causes steering to pull to one side or another when braking. Even if you don’t identify one of the specific problems listed above with your brake system, it’s always best to have peace of mind when it comes to such an essential system in your car. Bring your vehicle in to Master Muffler today to get comprehensive check and ensure that everything is running smoothly.